I have survived my first week at the library. And you know what? I love it! I’ve had some ridiculously awesome reference questions (“Can you help me find a book about the Holocaust and puppets?”), and seen some ridiculously adorable children talking about dinosaurs (we have a dino display). I’m so happy with the job, it’s almost frightening. And because of that, I want to celebrate by giving stuff away! Like most libraries, we have a mini store that sells donated books. I’ve decided that periodically, whenever a book I love is dropped off, I’m going to purchase it and give it away on my blog. Because I love you all. And I love supporting libraries. And I love books. So here’s my first giveaway! I adore Dessen’s books. They’re so rich and beautiful and engaging. This is one of my favorites. So when I saw it on the shelf, I had to adopt it. Like I said, it’s a used book so it has some wear (bent pages), but otherwise it’s perfectly fine. 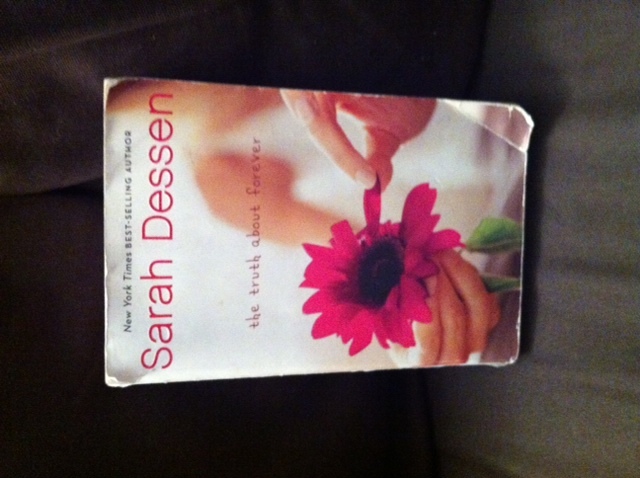 Want the Dessen book? Comment below! Tell me your favorite dinosaur, and you’ll be entered to win it. Deadline March 22nd. Good luck! I haven’t read this one yet! Fav dinosaur- the flying kind (Teradactyl??). Cuz they were cool. I’d love this! I’ve heard so many wonderful things about her writing but I’ve yet to pick up one of her books. This will motivate me!